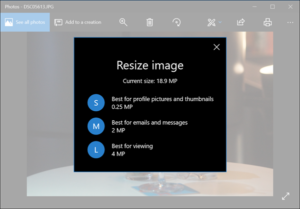 Home Blog Use the Windows 10 Photos App to quickly resize images. Posted by cci34900 on Sep 6, 2018 in Blog, Uncategorized | Comments Off on Use the Windows 10 Photos App to quickly resize images. The Windows Photos app comes already installed in Windows 10. This app is for viewing images and performing basic editing tasks. 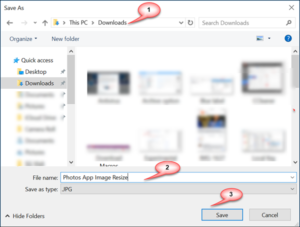 But in addition to editing images, splitting videos or merging them together, the Windows Photos app comes with a Resize option that allows the changing of the image dimensions and reduces the file size as desired. No matter which digital camera you use, the images captured by it produces quite large files when seen on a computer and other mobile devices. 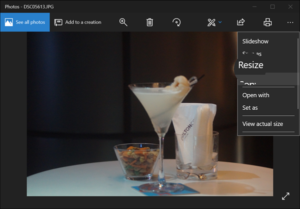 To save space on a computer’s hard drive or to share such images with others via email, you must resize them to a suitable limit.